Alright, Halloween was over two weeks ago, so obviously this post isn’t going to be related to those kinds of horrors. This Farm of Horrors is about something far scarier. Living in the country brings all sorts of danger. I fully accept that on any given day I could find myself in a Jack London-like struggle with some wild beast, most likely while on my way to get the paper wearing nothing but a robe and Hello Kitty boxers. Hey, I’ve seen “When Animals Attack.” I know all about the fauna we can expect to run into. What I didn’t expect was that we’d live in absolute fear of the flora. That’s right – the damned plants. It turns out that there are enough of them out there to make anyone’s life pretty miserable. We have to live with the day-to-day realities of abrasions, rashes, splinters and puncture wounds – as well as other, more troubling threats. Jesus God almighty! What the hell is this thing defending itself against? A Mongol invasion? I mean, Blackberries taste good and all, but is this really evolutionarily necessary? Bananas taste pretty good too, and you don’t see them arming themselves with horrific, flesh-tearing spikes. And like weeds, they swallow up every inch and every acre they come near, blanketing the land like that tangled barbed wire you see in old war movies. 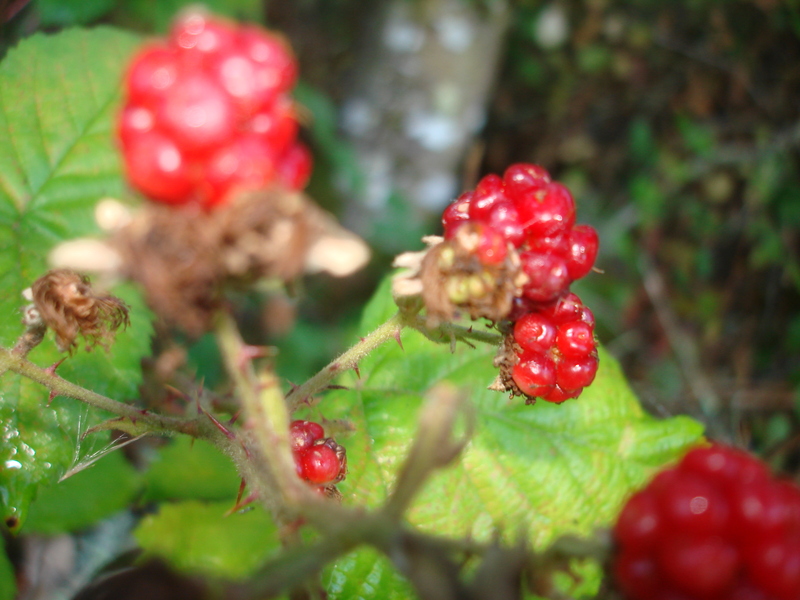 We’ve got them all over the place (the Blackberries, not the WW II-era barbed wire), and I’ve been stuck about a hundred times. I used to think these were neat. Now I want them all to die. Ah, Thistle. Eeyore likes them, so how bad can they be? I seem to remember something in “A Visit from St. Nicholas” about their downy spores. 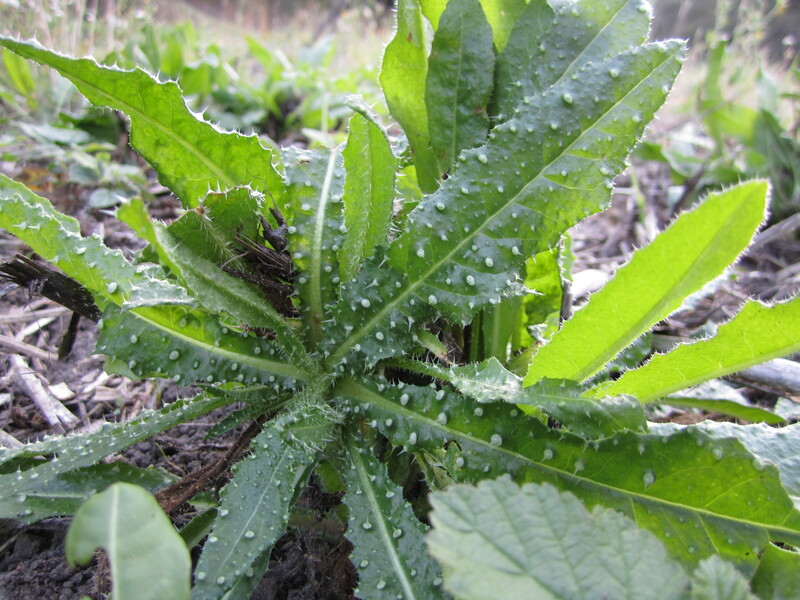 The problem is that these babies have sharp prickles that cover almost every part of the plant – stem, leaf and flower. The point, it seems, is to discourage herbivorous animals from eating it. All it really does is discourage us from ever leaving the house in anything less than knee-high rubber boots. And those downy spores floating angelically through the air? 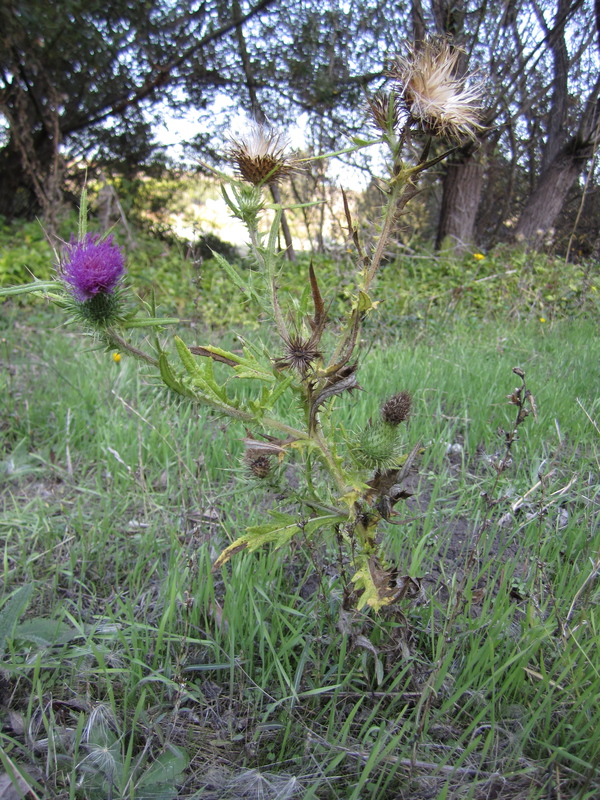 Just creating more thistles. Even the sprouts hurt, and right now the little sprouts are everywhere. 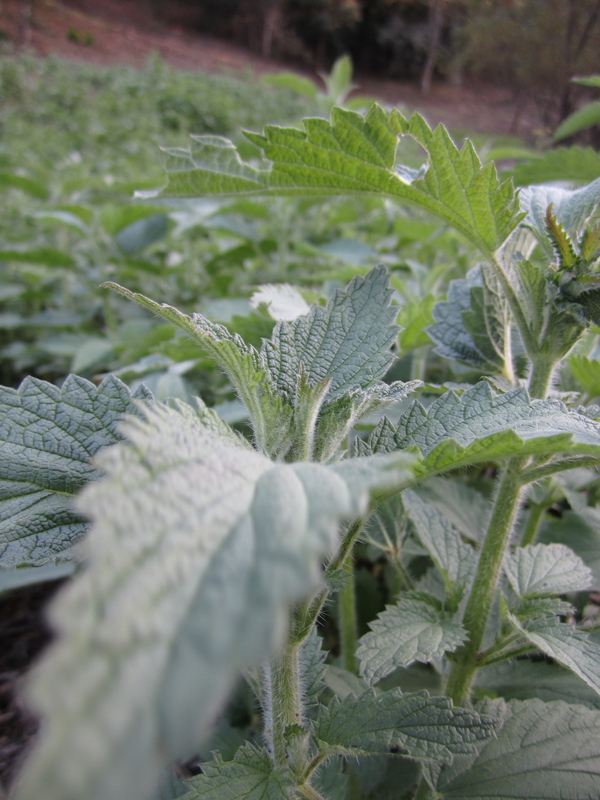 This is the succinctly and unambiguously named Stinging Nettle. If you look closely at the picture above you’ll see that there are, again, more spikes to deal with, covering both the leaves and the stems, but there are two major differences here: one, the pointy bits are much smaller, cilia-like hairs (called trichomes), and two, they don’t poke you so much as they inject you with painful histamines. It stings, alright. Like crazy. And we have an actual field of it. Just brush past one of these and you’ll feel it for an hour. 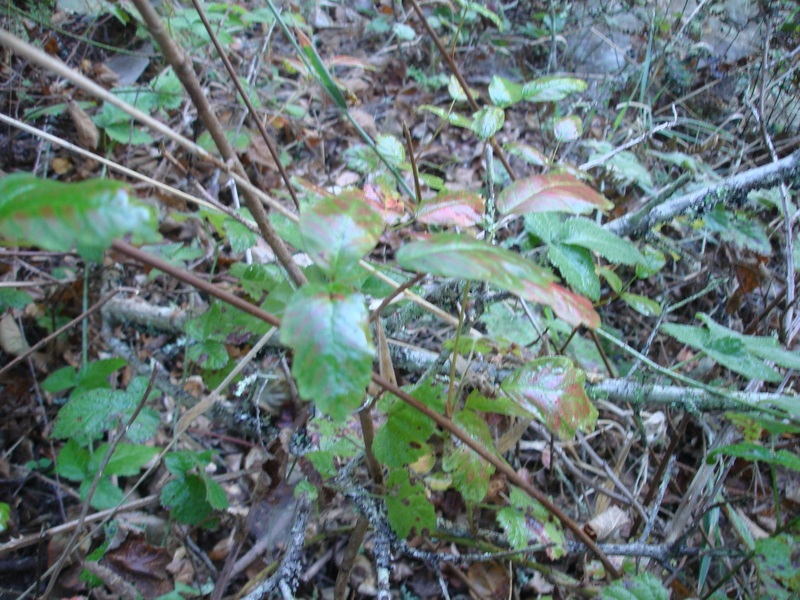 Poison Oak, our Bete´noire´. 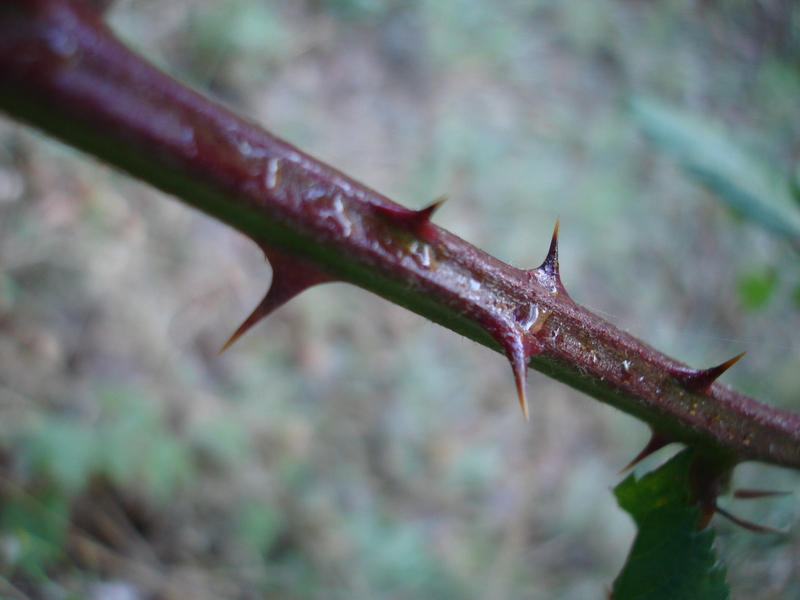 Touch one of these for even a second and you’ll wind up with unbearable itching and numerous red spots all over your body. And it’ll last for weeks. For the first couple of months out here Lizzy and I, having spent many a day exploring the property, were pretty much covered with the stuff. Some days we hadn’t even been near it, but still managed to contact it. I swear it senses our presence and physically leaps out at us. 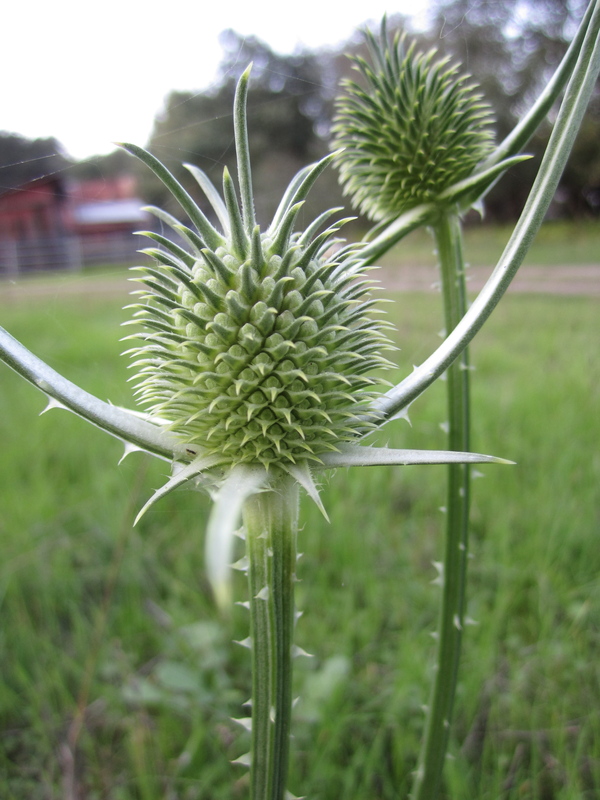 They call this one Jimson Weed. This isn’t the best picture I could have used, as it gives the reader the impression that, as with the Thistle, spikes are its only threat. If only. In truth this plant contains a powerful poison that, when ingested, causes delerium, hypothermia, photophobia, amnesia, and a bunch of other things I read on Wikipedia. A trip to the hospital would be pretty much guaranteed. This might sound like an average Saturday night for most young people, but for me – not so much. 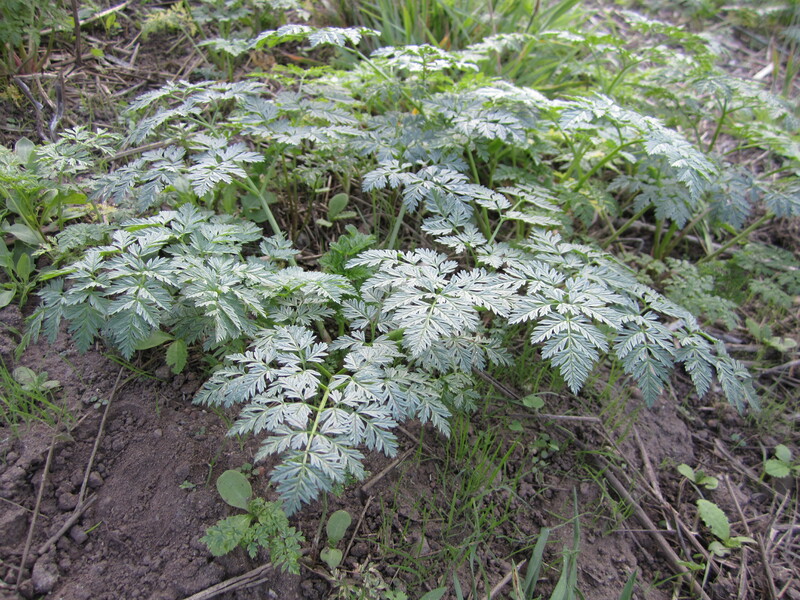 This is what is known as Poison Hemlock. Here, as with most of the other pictures, the plant is quite young. At maturity it will shoot upwards and produce tiny white flowers not unlike Queen Anne’s Lace. It’s rather pretty, actually, until you realize that this is the plant that killed Socrates. It contains a dreadful – and deadly – neurotoxin that will wreak havoc on your central nervous system and result in total respiratory collapse. In fact, it is so poisonous that if a full-grown adult were to ingest just a handful of leaves, that adult would probably die. I particularly like how it resembles carrot greens when it’s young. That’s convenient. Oh, and see those cute, little green shoots around the Poison Hemlock in the picture above? Baby Thistle. p.s. I’ve been haranguing Lizzy to post something soon, so stay tuned for something from her!